For many children, school lunches are the most nutritious and sometimes the only meal they will receive in a day. Currently, 52% of students in LCISD qualify for free or reduced meals. However, if a child's family is unable to pay for their meal, a debt is accrued. Once the debt reaches $15.00, these children are then offered an alternate meal of a cold cheese sandwich and milk. This is a standard procedure for most districts in the Houston area, until the debt is paid off. No child should endure the guilt or embarrassment of not being able to pay for a hot lunch. LCISD currently has 10 campuses out of 38 that are eligible for the CEP (community eligibility provision) program which entitles every child on campus a free lunch. However, the other 18 campuses do NOT have this privilege and NO secondary schools are currently eligible for the program. Please join me in helping to ease the burden of these families and ensuring these kids get a full hot meal each day. It is a small, but meaningful gift we can offer to our community and local public schools. It'll also help ease the burden on our school district and food service staff who do not like turning children away. Many of us may have endured similar situations as a child or may know someone who has. We may even remember asking a friend to lend us lunch money or may have even lent money. This is especially common amongst middle and high schoolers. As of March 8, 2017, the Lamar CISD lunch debt for children who are at risk of losing a hot meal and have a debt over $10.00 is $15,519.88. I am working directly with the LCISD Food Service Director to help alleviate this debt. I'm also working with LCISD Common Threads which is a non-profit clothing assistance program for students at Lamar CISD. They will help with the distribution of funds to the needed student accounts and will also take your donation if your feel more comfortable directly donating to them. Please contact Jill Duban at jduban@lcisd.org. She will be able to assist you with your donation. 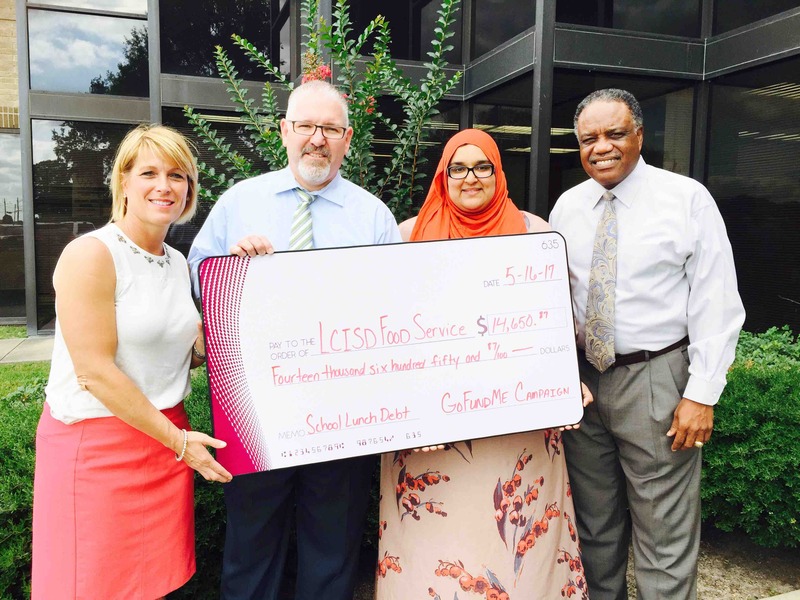 However, let her know that you want to donate for the gofundme school lunch debt initiative managed by Amina Ishaq. Please help if you can, and if you are unable to donate that's okay! Just please share! “Those of us who are warm and dry and safe and well fed must show up for those who are cold and wet and endangered and hungry. That’s a rule of life. Every ethical and religious and spiritual tradition in the world agrees on that rule.” -E.G. As of today no child at LCISD will be eating a cold cheese sandwich for as long as the money collected can sustain it. They will all be receiving hot meals. Of course this is a short term solution to a long-term problem. BUT we helped students who have had debt following them through the years as well as students who may not have been able to walk in their high school graduation. Our second donation check for this initiative was given today at the LCISD District office, alongside our superintendent, food service director, and parent involvement coordinator. Our first donation check was given on April 10th in the amount of $1693.68 and today we gave $14,650.87. We also had a few families who donated directly to the food service department. GoFundMe also takes a percentage of the amount collected for using their crowdfunding platform which totaled $1507. Just remember you can always contact your district to help pay off a child's lunch debt on your own. If we all chip in to alleviate this problem until something bigger and better is put in place, no child will go hungry or feel stigmatized because of their families socioeconomic status. Let's work with our local Communty legislators to fight for a TRUE free public school system where every child regardless of their families income status are provided a free hot meal. This way every child is treated the same and there is no stigma attached to a free or reduced lunch. Thank YOU for being a part of a small local grassroots effort to help alleviate childhood hunger. You're amazing! Here is a video update on what's going on with our campaign. We have reached our initial goal of $15,500! Over $13,000 collected today due to the coverage on CNN. Thanks so much! I'm raising the initial goal so that we can put the rest of the money towards kids at LCISD who are most likely in jeopardy of losing their hot meals on a regular basis. The food service department knows of these children and their struggles. They will put the money in their accounts so that they can eat for the rest of the year and hopefully go into next year. A surplus for these kids will allow them to eat a hot meal for an extended time. Thanks so much to all of our donors and everyone who has shared this initiative. It's a united local grassroots effort that is taking a national stage. These are the small baby-steps that we take in order to see real change. Positive change in the national conversation towards awareness of this lunch crisis and hopefully change in legislation that will allow all of our children in public schools a free meal regardless of income! Today I was at the LCISD district office for a volunteer appreciation lunch. I ran into an LCISD employee who shared a heartwarming story with me. She shared her appreciation for the awareness and funds that this campaign had collected. She then went on to tell me about a 10th grader at a local high school who directly benefited from these funds. This student had over a $200 school lunch debt that had been following her since elementary school. The student had at the time moved back with her mom who couldn't afford to pay for her lunches. But she also was not eligible for free or reduced lunches. The student had been getting calls from the food service department twice a week, every week ever since. The debt would have also effected her future graduation. This student is so thankful and we all made it happen! We helped a student who was feeling the burden of guilt for something she could not control. You all are amazing! Let's try to help more students just like this one. Keep sharing this campaign and we can collect more funds for students who should not be feeling guilty or ashamed! Thank you for caring about the kids in Fort Bend. Hebrews 13:12 The love of Christ compels me.